I love providing you guys with various ways that you can save money. 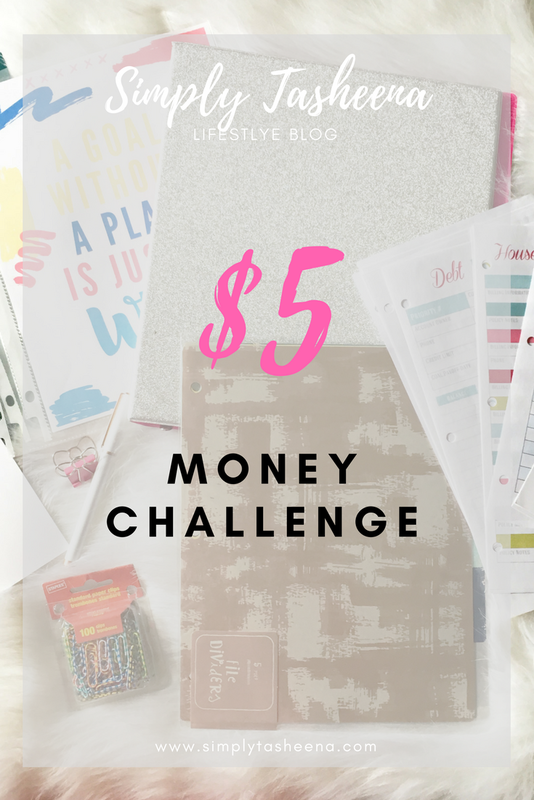 A couple of years ago I tried the 52-week Money Challenge and also the $5 challenge. Now you're probably wondering what the $5 challenge is. Every time five dollars comes in your possession. From a transaction or from receiving it as a gift. You save it. What I love about this challenge is that you can use the money for anything it holds you to be accountable. For example, you go to the grocery store and you receive change back totaling $15.25. Instead of keeping the money in your wallet. You tuck the money away in a place that you know that you won't touch. You no longer have $15.25, you now have $10.25. What may work for you as well, is creating a savings account and then depositing the money into the account once it reaches a certain amount. You can also track how much money you're saving each month on a piece of paper, on your phone or even a spreadsheet. What I love most about this challenge is that there is no pressure. You save when you can. Of course, each month your goal is to continue to be consistent and save more. But I find the main goal is actually being consistent with saving. This actually helps you with creating good saving habits. You know that you now have $10.25 and it's up to you to hold yourself accountable and not spend the money. If you're looking for a savings challenge to start off with or something to add to the bunch. This is perfect! Have you joined any money challenges this year? I have not joined any money challenges but have heard of them. I do like challenges and it would be fun to see how much I had at the end of the year. I love the idea of the $5 challenge! My husband and I do something similar by taking money from our paycheck to deposit directly into a savings account. That way we can basically just pretend the money wasn't there in the first place and save save save! I have this jar at home where I placed all my extra change. Eventually I used it to make my utility bills! It wasn't difficult coz saving has been part of my life since childhood. A friend of mine did this and posted a pic of the $5 bills to FB a few weeks ago. She saved $1400 in the year and used it to buy a plane ticket and hotel to Sweden. So happy for her. I love money challenges! It helps you better manage your cash. It's helped us with purchasing our home this past summer.